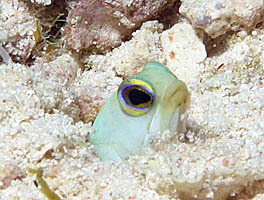 Yellowheaded Jawfish live in holes they dig in the sand. These cute little fish swim tail first down into their holes, racing out to catch food in the water. Click here to see this fish up close. 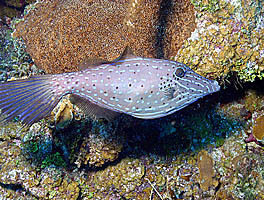 Scrawled Filefish are as shy as they are funny looking. Click here to see two good pictures of this unusual fish.